Awarded SARTA “Distinguished Achievement in Clean Tech” award on 11/2011. In 2008 was ranked the 9th fastest growing business in Sacramento by the Sacramento Business Journal. As oil prices have begun to skyrocket to record levels, many people are turning to solar as a solution for their energy needs. Skyline® collectors and systems are becoming more high profile in the solar industry for their many important advantages. Founded ACR SOLAR INTERNATIONAL CORP. in 1997 to manufacture “FIREBALL 2001” solar heater (now “Skyline”) and develop other Patents and designs. Designed UP44T storage system, passive T20, “Islander”, “Fireball 2001”, and “MegaMat” systems. Awarded U.S. Patents for the “Fireball 2001” (now “Skyline”) in 1999 and on the MegaMat in 2000. 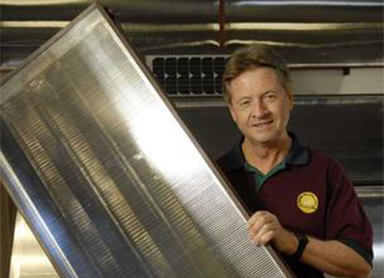 Founder and President of AMERICAN SOLAR NETWORK, Ltd., Herndon, VA in 1988, a socially responsible, innovative technology company which manufactured the solar “SKYLITE” water heater. Invented, Patented, Prototyped and Manufactured the award-winning solar “SKYLITE”™ water heater in 1988, the only truly attractive, skylight appearing solar system manufactured in the world. A second Patent on the unique collector venting system was granted in Sept. 1994. One of less than 580 out of over 30,000 applicants to be recognized by the DOE Energy-Related Inventions Program (ERIP). A $99,294 Grant Award was made in Sept. 1993 for further research. Consultant and Lecturer on Inventors at the University of VA under a Leadership, Science and Humanities Program Grant from Nat. Sci. Foundation and Nat. Endowment for the Humanities, 5/93. Moved ASN, ACRS, and family to Carmichael, CA in Dec. 1992 to fully participate in the Sacramento Municipal Utility District (SMUD) Solar Program created by S. David Freeman. Won both SMUD “Auditor Program” bid rounds for $629,250 in total Contracts in 1993. First in the nation to receive national Solar Rating and Certification Corp. (SRCC) OG300 ratings. Consultant to GreenPeace and PrimeTime Live on Whitehouse “Solar Gate” story. Completed 27 unit HUD contract in Norton, VA at record low cost, 1992 (under $2,000 per unit). Member: Solar Energy Industries Association (SEIA); International Solar Energy Society (ISES); American Solar Energy Society (ASES); American Society of Heating, Refrigerating and Air-Conditioning Engineers, (ASHREA); International Association of Plumbers & Mechanical Officials (IAPMO), Northern California Solar Energy Association. Consultant and Contractor to Rockwell International, Energy Technology Engineering Center; Solar Energy Research Institute for DOE; National SEIA; SANDIA National Laboratories. Assisted in US Senate Subcommittee Hearings, Installed White House “Pageant of Peace” PV system in 1988. Founder of AC-Rich & Sun, R&D, sales, consultation, installation, service and training for solar domestic water heating, pool heating and PV systems. President, Cambridge Alternative Power Company. (81-82), Chairperson of the New England Solar Energy Association. (NESEA) Bay Chapter Solar DHW Committee. Speaker for NESEA on Solar DHW, at MIT, Cambridge, MA, Member, Gov. Dukakis Energy Advisors Committee, Member and organizer, Earth Day Committee, Boston, MA, Entrepreneurship speaker at Babson College, Wellesley, MA. Consultant and trainer for companies entering Solar, Held professional sales and install seminars. Marketed & Improved Heliophase, a unique, freeze-proof, passive solar DHW system. Installed first two solar systems for the U.S. Navy at the Indianhead, MD Naval Ordinance Station. Member Board of Directors, NH Solar Energy Association. Studied Solar under Bruce Anderson, author of “The Solar Home Book”. Studied solar, methane gasification, composting, and water rams at New Life Farm, Drury, MO.